Enjoying life and the break Mr. Dragon has had from treatments. Tomorrow we start again with all the restaging procedures before surgery on March 9. 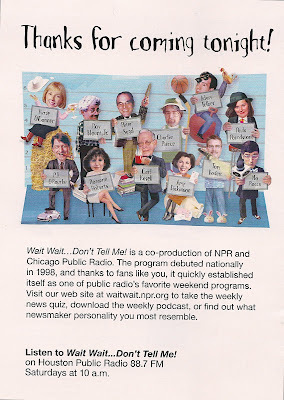 Meanwhile, we love NPR - National Public Radio. When we heard "Wait Wait ... Don't Tell Me!" was going to tape in Houston, we knew we had to go. They were here two nights and both were sold out. This adventure was our Valentine's present to each other. Peter Sagal started us off laughing by saying "all the liberals in south east Texas must be here tonight"!!! Two hours later and we were still laughing! Don't know when I have ever laughed so hard. You might have caught the broadcast that was taped in Houston. That was us! We heard it here on February 13. 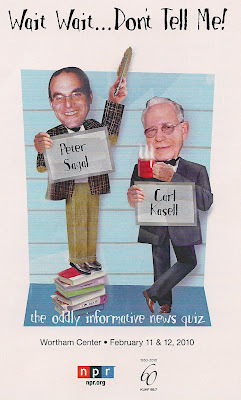 The show was 30 minutes late starting as Carl Kasell had a hard time flying from Washington DC to Houston ... it was the weekend of one of the bad winter storms. Tom Bodett, Kyrie O'Connor (the Houston girl) and Paula Poundstone were the panelists. Too much fun. We've been to the zoo and saw, for the first time, the memorial brick we ordered for Mr. Rocket Man. (Oh, my ... how we miss that little guy ... still.) It is right in the middle of the entry way of the zoo. Perfect! Baseball is keeping us busy. We watched 6 college games this weekend! Mr. Dragon as he begins the restaging procedures and has surgery next week on March 9. It's from the Relish magazine that comes in our little community newspaper. 1. Place bacon in a large saucepan over medium heat. Cook 5 minutes or until almost crisp. Add onion, celery and carrot; cook 5 minutes. Add zucchini and garlic; cook 3 minutes. Add tomatoes, beans, broth, salt and pepper. Bring to a boil, reduce heat and simmer 10 minutes. Stir in spinach. Ladle into soup bowls and top with grated cheese. Makes 10 cups. Serves 6. I have to admit - I haven't made this soup yet. But it looks so good, has ingredients I love and is easy! Here's a recipe I have made and I can tell you it is delicious. A friend knew I was looking for easy, nutritious soup recipes and this is one she found at the Food Network. 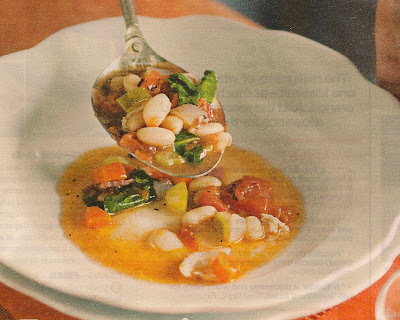 In a medium bowl, cover the beans with wateer by at least 1-inch and leave them in the refrigerator for 6 hours or overnight. Drain. In a large stockpot over low to medium heat, saute the onions with the olive oil until the onions are translucent, 10 to 15 minutes. Add the garlic and cook over low heat for 3 more minutes. Add the drained white beans, rosemayr, chicken stock, and bay leaf. Cover, bring to a boil, and simmer for 30 to 40 minutes, until the beans are very soft. Remove the rosemary branch and the bay leaf. Pass the soup through the coarsest blade of a food mill, or place in the bowl of a food processor fitted with a steel blade and pulse until coarsely pureed. Return the soup to the pot to reheat and add salt and pepper, to taste. Serve hot. I'd like you to meet a Patas monkey from the Houston Zoo. The Patas monkey is probably the fastest primate on earth, its long legs giving it a tremendous loping stride. Speeds reach up to 35 mph. They are highly terrestrial spending most of their time on the ground. The species has a wide distribution in the savanna and woodlands areas across sub-Saharan Africa from the western tip of Senegal to East Africa. The conservation of patas monkeys is critical because of their already small population size, limited geographic range and the current destruction of their habitats. Hunting by humans has increased progressively, especially in West Africa. Hunters kill patas monkeys for meat in the Ivory Coast. The mountain Nuba people and tribal groups also hunt patas monkeys. Many farmers and plantation owners shoot these monkeys when they raid their crops. Patas monkeys are collected and sold as pets or they are sold to medical research institutions. Over 1000 patas monkeys are collected per year. The lovely Marie is our postmistress for Postcard Friendship Friday. Today Marie has a card featuring the letter W and a story about Braille. I thought today I'd celebrate Canada - in honor of the beautiful country to the north that has brought us the winter Olympics this year. I don't have Vancouver postcards, so it's off to Toronto we go. All of these cards were sent to me by a dear blogging friend of mine. If you haven't met Sherry, you should! I've told you that I have a *thing* for calendars. When I saw this on my travels during OWOH, I knew it was meant for me! Today it arrived in the mail. Patricia is a wonderful artist. Her illustrations are great. They make me smile. Please visit Patricia at My Cosmopolitan Diary. You'll be glad you did! Now I ask you. How could I resist sharing this email from the Daily OM about one of my favorite subjects -- Reading For Pleasure? I've even included a couple of reviews at the end! A Whole New World When reading we remove ourselves from the confines of reality to immerse ourselves in the intrigue of the unfamiliar. A couple of reviews for you from my Goodreads list. The first a non-fiction book and the second a cozy mystery. There's a book out there, somewhere for you -- no matter what your interests. Go for it! Most of you know how crazy we are about college baseball. We've just recently started reading baseball books. Play by Play was one we found at Half-Price Books. It is about Neal Conan (of NPR and Talk of the Nation fame) and the year he took off from NPR to follow his dream of being a baseball play-by-play announcer. 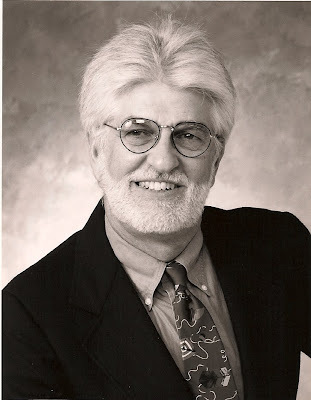 From the book jacket: " Following nearly twenty-five years as a prominent voice at National Public Radio, after being shelled, rocketed, bombed and held captive in the desert as one of their top foreign correspondents, Neal Conan decided to pursue a lifelong dream -- to become, of all things, a baseball announcer. And, that's what he did, specifically with the Aberdeen Arsenal, a franchise of the independent Atlantic League. Not the majors, alas, but it afforded him a rue opportunity to use the surge of conflicting emotions that we refer to as midlife crisis to rethink what he'd done and what he was doing. It also allowed Neal to marry his two lifelong passions - radio and baseball - and gave him the chance to return to the grassroots of each. He decided to put the fun and challenge back into things he had become bored with." Lot's of fun baseball trivia in Play by Play. For instance: " One of Tyrone Horne's bats is in Cooperstown. In 1998 Tyrone did something unprecedented: he homered for the cycle. Hitting for the cycle is unusual, once a year or so, somebody will get a single,double, triple and home run in the same game. Four homers in a game is much rarer, and, so far as anyone knows, Tyrone is the only professional ballplayer every to hit a solo shot, a two-run job, a three-run homer and a grand slam in the same game." Conan shares other stories throughout the book. If you are baseball fan or a fan of Conan's from NPR, I believe you'll enjoy this book. Kelly's friend Jennifer is a top notch knitter and a bit of a party girl. But she's always stayed one step ahead of trouble, until the night a stranger follows her home. As Jennifer recovers from the dangerous encounter, she looks to Kelly and their other close-knit friends for comfort and support. A retreat in the mountains, stitching and talking seems to be just what the doctor ordered. Surprise! The owner of the ranch turns out to be Jennifer's attacker and when he ends up dead - Jennifer is at the top of the suspect list. All the usual characters return in this cozy mystery. Sefton gets 5 stars for the banter between the characters in this novel. She gets two stars for the story itself and the way it was written. I haven't quite put my finger on it, but I didn't think this one was written as well as the previous novels in the series. Perhaps Sefton has reached the *too many books in the series* itis! I enjoy visiting with the characters and love the knitting/weaving/crochet shop - Lambspun. Today you are getting a two for one (or is that a one for two)?!!! Mosaic Monday's hostess is the lovely Mary at The Little Red House. Be sure to visit. It's also time for My World where you can travel around the world without leaving home. The weather finally cooperated last week and on Friday we went to Hermann Park. It wasn't raining, it wasn't too cold, but the sun wasn't shining. Too bad! French artist Bernar Venet transformed Hermann Park from a green space into an outdoor gallery with the exhibit "The Monumental Sculpture of Bernar Venet" and we wanted to see them. As you can tell, the sculptures are enormous. Some tower 30 feet and weigh 12 tons. Venet's sculptures have been called "monumental linear improvisations." The beams are bent into arcs and curves. Venet allows each beam's unique reaction to extreme heat and pressure to play a role in the final form. The works are simple, inviting, playful. We watched several small children walk up to them in awe, look around as if to see if anyone was watching, and walk/climb through. One of the sculptures had a sign to please not touch -- as if everyone could resist! We called our favorite "the blooming onion"! The exhibition, sponsored by the Texan French Alliance for the Arts (TFAA), opened in January and will remain on display for nine months. I had to throw in some of the *regulars* found in Hermann Park: the train, Mr. Hermann himself, and the wonderful, well fed, top-knot duck! Have you ever seen anything so pretty?!!! You should feel how dreamy soft it is. It was my Mail Call OWOH winnings from the wonderful and talented Beth. Thank you so very much, Beth. I wear scarves a lot, will put this one to good use, and wear it with pride. Be sure to visit Beth. 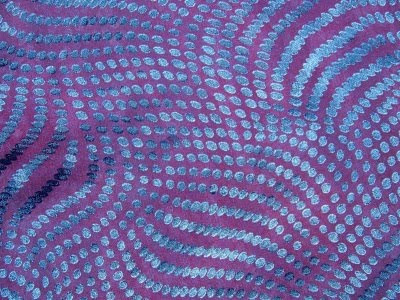 She hand dyes fabrics and is a quilter. The scarf is a hand dyed silk. Beth uses a two step process to get the wonderful colors. Our lovely postmistress, Marie, is the hostess for Postcard Friendship Friday. Today she posted a little girl with a canary. This is from The Audubon Postcard Folio 30 full-color photographs of John James Audubon's magnificent The Birds of America to mail, share, and cherish. On the back of the card: Carolina Parrot, Psitacus Carolinensis, M.1, F. 2, Young 3, Plant Vulgo, Cuckle Burr, Plate 26, from The Birds of America by John James Audubon, 1827. National Gallery of Art, Washington/Gift of Mrs. Walter B. James. The Audubon Postcard Folio, 1986 by Running Press Book Publishers. Wordless Wednesday: Never Grow Up! Mary, at The Little Red House is the hostess for Mosaic Monday. 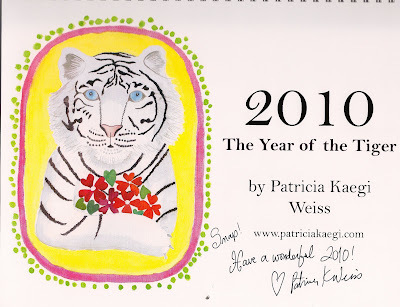 Not only was yesterday Valentine's Day, it was also the Lunar New Year, the Year of the Tiger. Some of the photos are of the money envelopes that are commonly used for Chinese New Year, Weddings, birthdays - any special event. During the Chinese New Year, money envelopes are normally given by married to unmarried individuals, regardless of age. Tradition is to give an even numbered increment of money enclosed in a red envelope and include wishes of peace, good fortune, prosperity, success and happiness. On Mosaic Monday, I wish for you: peace, good fortune, prosperity, success, happiness and time with your loved ones. OWOH: We Have A Winner! The winner (by random number generator) of the One World One Heart Give-a-way is SusanScraps! Susan, please email me with all your information. I've left a message on your blog and sent you an email. Congratulations! I hope everyone participating had a wonderful time, meeting new people, seeing new blogs, making new friends. I did! There's lots to celebrate today. It is the Lunar New Year. Losar, the Tibetan New Year. The Year of the Iron Tiger. The Tibetan New Year Festival, Losar, can be traced back to the time before the introduction of Buddhism in the sixth century C.E. when the Bön religion was predominant. Every winter, a spiritual ritual was performed in which incense was offered to calm the spirits, deities and protectors of the land. It was said to have been started when an old woman introduced the measuring of time based on the different phases of the moon. This later evolved into an annual Buddhist festival. Since the 13th century, Losar has traditionally fallen on the first day of the first month of the calendar year, which is lunar-based—unlike our solar western calendar. However, before the coming of a new year can be celebrated, unfinished business and unhappy memories must be dealt with. And so, on the 29th day [February 12] of the last month in the old year, there is a festival called Gutor, in which everyone whitewashes and cleans their houses. The last day of the old year is spent preparing for the new year. People go to monasteries to make offerings, and to participate in the ceremonies conducted during the day. Many rituals take place that are designed to chase away any evil spirits. One of these is a play in which the lamas perform masked dances to symbolize the triumph of good over evil. New Year's Eve is Lu Yugpa, an opportunity to banish evil spirits from the old year and clear the way for starting the new year right. In modern times the preparations for Losar consist of collecting fresh roasted barley flour for phyemar (this symbolizes good wishes); lophud, a young wheat sprout that is the symbol of the birth of a new year; chang, a mild barley beer; sweet rice, tea, butter, fried biscuits, sweets, fruits and butter lamps. A complete collection of these seasonal foods is always placed on the family's Buddhist altar as an offering. The entire neighborhood is cleaned and houses are freshly painted. New clothing is sewn and new curtains are put over the doors and windows. There is a saying in Tibet, "Losar is Lekar," meaning the new year is new work! On the first day, at sunrise, the wife runs to collect the year's first bucket of water. She burns incense at the well or river, ties a white scarf around the tap or nearby tree and gives a food offering of the first portion of the special foods for the celebration to appease the nagas (subterranean serpents and spirits). A special breakfast is prepared, everyone wears new clothes for the year, and a special Buddhist practice is performed at the family altar. When the formal family ceremony is over, the household members run to their neighbors' houses shouting Tashe Delek!—literally, "Good Fortune!" As on Christmas morning in the west, on the morning of Losar the children love to fill their pockets with sweets and show off their new outfits. According to Khenpo Tsewang Dongyal, "Each new year is an echo of the changing cycles and Losar reminds us of the true nature of impermanence. Everything that is born is bound to die. The old year is gone and will never exist again. The new year gives us the opportunity to come together and celebrate; to notice and appreciate each moment, in the moment, and to realize the blessings of the teachings." —excerpted from a story by Margret Dunham from the Padmasambhava Buddhist Center's website at www.padmasambhava.org . This is my Valentine -- everyday of the year. May you be with those you love. It's Saturday and that means Camera Critters time! The lovely Misty is our hostess for Critters. Be sure to visit! Back to the Houston Zoo and giraffe feeding. I'm not too sure about feeding this guy, Dad. Grandpa gets into the act. Mom seems to like feeding the giraffes. Postcard Friendship Friday is hosted by our lovely postmistress, Marie. With her post, Marie talked about "the cat being out of the bag". 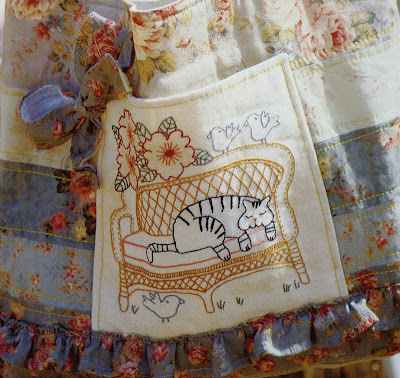 This is a postcard from the book The Cat Postcard Book by Running Book Publishers. Chromolithograph, Hallmark Historical Collection, Hallmark Cards, Inc.
On the very front of the card in the lower right side it reads, With Heartiest Wishes for a Merry Christmas! "Chromolithography is a method for making multi-color prints. This type of color printing stemmed from the process of lithography, and it includes all types of lithography that are printed in color. When chromolithography is used to reproduce photographs, the term photochrom is frequently used. Chromolithography replaced coloring prints by hand, and eventually served as a replica of a real painting. Lithographers sought to find a way to print on flat surfaces with the use of chemicals instead of relief or intaglio printing. Depending on the number of colors present, a chromolithograph could take months to produce. To make what was once referred to as a “chromo”, a lithographer – using a finished painting as a model – gradually built and corrected the print to look as much as possible like the painting in front of him, sometimes using dozens of layers.The process can be very time-consuming and cumbersome, contingent upon the skill of the lithographer." You just can't beat a bag full of kitties! This is my first Mosaic Monday . Mary at The Dear Little Red House is the hostess. I'm sharing some works in progress -- or works to be! 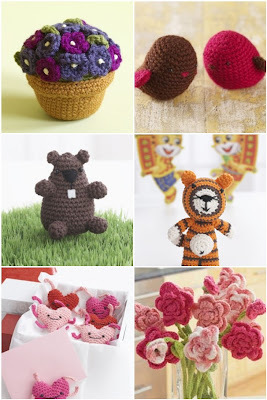 They are all crochet and they all make my fingers itch! Perhaps, most importantly, they make me smile! All of these can be seen in closeup at Flickr. I know. It's Critter day. But Mr. Dragon and I have a big baseball day today! Rice Alumni Baseball game starting this morning and then an afternoon scrimmage with the *real* team. I had to share it with you! Isn't this marvelous? Go over to Red Brolly and get the pattern! You'll have to scroll down a bit, but you'll find it! Marie is our lovely postmistress for Postcard Friendship Friday. Marie posted a beautiful card of little girl who is dog tired. This postcard is from a postcard book of 30 "elegant full-color postcards of the exquisite and mysterious Unicorn to mail, share, and cherish" published by Running Press Book Publishers and the artist, Michael Green. "UNICORN AND DREAMING MAIDEN IN LANDSCAPE"
Oil on treated paper. 31.8 by 49.2 cm. "The Unicorn has a singular virtue, that he can penetrate our dreams, and there address us. Therefore take heed, O Dreamer, when the Unicorn appears to thee. Though his speech is unlike any tongue of Man, yet shalt thou comprehend!" "From the book UNICORNIS: On the History and Truth of the Unicorn, published by Running Press. Copyright 1983, 1986 by Michael Green. All rights reserved." "The pictures reproduced on these postcards are drawn from the fabulous Unicornis Manuscript - an extraordinary document which, according to legend, languished for more than four centuries in the care of the Collegium Gnosticium, a mysterious Gnostic brotherhood. This curious work, a strange amalgam of Medieval and early Renaissance thought, was only recently brought to public attention through the ministrations of Michael Green, who assisted its translation and publication as De Historia et Veritate Unicornis (On the History and Truth of the Unicorn)." I'd add that your habits also create your confidence, courage and even your creativity! One of the best ways to generate great results is to create a morning ritual. A powerful morning ritual sets the tone for your entire day - and your entire year! Exercise is called "The Number One Form of Preventive Medicine." Many people don't meditate because they find it intimidating. I say, start with just 5 minutes. Meditation connects you to your center, and to the deep silence that surpasses any drama that might be happening in the world of your personality. Don't worry about doing it right. Just allow yourself the time to BE. "Intention rules the earth," says Oprah Winfrey. It's true! Your intention is a powerful force to engage. You don't have to know the HOW. You just need to set the intention so your inner GPS can stay on target! Before I get out of bed, I silently create a morning gratitude list. When I begin my day remembering my "gratitudes," (instead of my "anxieties") my heart fills with extreme joy and deep awareness. I then bring that energy into everything I do - and to everyone with whom I connect. Your choice of breakfast foods can set up your success with other meals as well. Start your day off in the healthiest way possible for you - and make it a ritual, not a chore. Everyone needs a "Not To Do" morning list. Suggestions here include anything that brings up a "reactive" state: Turning on the local news. Checking email. Answering texts. Answering the phone. After reading this article, don't just think, "Wow. Those are some good ideas. I should try one or two." Performer, songwriter, and creativity consultant Christine Kane publishes her 'LiveCreative' weekly ezine with more than 11,000 subscribers. If you want to be the artist of your life and create authentic and lasting success, you can sign up for a FRE*E subscription to LiveCreative at www.christinekane.com. See Christine's blog - Be Creative. Be Conscious. Be Courageous - at ChristineKane.com/blog. It's time to share the February Lesson from Dharma Days 2010 Calendar: Art, Musings, and Meditations for the Spiritual Path by Dairyu Michael Wenger. 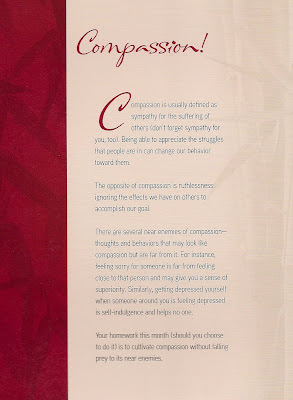 My homework for this month is to cultivate compassion without falling prey to its near enemies. For instance, feeling sorry for someone is far from feeling close to that person and may give you a sense of superiority. Getting depressed yourself when someone around you is feeling depressed is self-indulgence and helps no one. I'm still working on January's don't be critical! February 8 (or in some calendars February 15) - Nirvana Day - is the final nirvana, which occurs upon the death of the body of someone who has attained complete awakening. This date celebrates the parinirvana of The Buddha. February 14 - Chinese New Year (Lunar New Year 4708) the year of the Tiger. It is also called Losar by the Tibetans (2137). Let's not forget Valentine's Day! The Catholic Church assimilated the pagan purification festival by linking it to the purification of the Virgin after the birth of Christ, "the light that brightens the darkness." Worshippers brought their year's supply of candles to the church to be blessed by the priest in a special Candle-Mass. Candlemas continues the celebration of new beginnings. It was a day to prepare the fields for new plantings and to bless the fields to ensure a good harvest. In England, the holiday greens were taken out of the house, and if even a leaf was left behind, it was unlucky. "Out with the old, in with the new" is the theme for Candlemas. It's a good day to make commitments, renew pledges, and plant seeds for new growth. Or plant some seeds of annual herbs in pots on a sunny windowsill, for later transplanting into your garden or deck containers. Some good choices: chives, dill, basil, cilantro. February 2 is also groundhog day. However you wait for the light and Spring to return, celebrate!